"crosses fingers he returns and makes the browns pay"
Robinson STUFFS Droughns on 3rd and 2 - nice one. Looks like it's his head/neck. Not good. Great Stop there!! 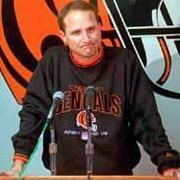 WHO DEY!!! Who drops their head like that making a tackle? That's pee-wee football 101. Looking to Reggie too much. Any update on the unluckiest guy not named Weathersby? there goes the shut out. That was their "gift" 3 points. We give them NADA from here. Could have been worse...good job D. That 3 points goes 100% on the O.